As usual this week’s assignment in CEP 811 was both super challenging and super fun! We were asked to think about all that we have learned in this course about the Maker Movement, and combine our ideas into an infographic. First, finding the right tool to convey the ideas that I wanted to share was very challenging. After playing a little bit with all of the tools that our instructors shared with us, I decided on Easelly as the tool that best fit my needs. Once I decided which tool would best serve my purpose, I had to decide on what information I wanted to share. I decided to look at Maker Education vs. Traditional Education, and why #MakerEd is so important as we go forward as an educational institution. Throughout this course I have focused on the ideas of Sir Ken Robinson and his premise that education as we know it was designed to fit the needs of the Industrial Revolution and have not changed since. My ideas have also been influenced by Halverson and Sheridan as they described what a 21st Century classroom could look like. I hope that you enjoy my infographic. Lesson planning within the Maker Movement is difficult, especially when you teacher a world language. Typically when we do reading on the maker movement, the ideas that are available out there only apply to the STEM courses, leaving us world language teachers out in the cold. As a World Language teacher I find incorporating the ideas of the Maker Movement to be difficult. In our language methodologies classes we learn that students need a ton of comprehensible input, and that output will come over time. It seems to me that within the Maker Movement we are asking students for output at an earlier stage. I chose to have them create a vocabulary game because they are still getting input while they make the game, and then they are providing input for our lower level students, while getting language output for themselves. I found that while I am giving up control of my class and of language input (extremely difficult and uncomfortable for some language teachers) I can still find other ways for my students to be provided with input and for them to achieve my desired learning targets. I hope that you enjoy my lesson plan linked above, and welcome any feedback or questions that you might have. After listening to Culatta’s Ted Talk, I have realized that I am a part of the problem that he is describing. Culatta talks about teachers using classroom technology to digitize old and ineffective teaching methods. Like many teachers, I am guilty of this. I post my daily warmup on the board every day using Google Slides. I will post my daily agenda this way, and I will post assignments for students to complete on there as well (replacing traditional bookwork). Technology has changed how I present things to students, but it really has not changed my instructional practices. This week in CEP 811, we continue looking at how we can use existing technology to do things that were not really possible in the past. I chose to look at research on personalized learning. The reason that I am interested in this topic is because it is an area that I have always struggled with as a teacher. I am a Spanish teacher, and as such I have a hard time meeting the differing needs in my classes that are all around 30 students, give or take a couple depending on the hour. I teach Spanish 2, which means that my language learners have yet to acquire a ton of language, so how do I differentiate for the students who have acquired more than others without it being detrimental to the order of my classroom. In my research, I came across a couple of really interesting articles on individualized learning. The first article that I found was called “Effects of an Individualized Narrative Intervention on Children’s Storytelling and Comprehension Skills.” The article is targeted more at pre-school teachers; however, being a world language teacher and teaching lower levels of world language, the article is relevant to what I do as my students are learning the language at a pre-school to elementary level. The article focuses on the importance of narrative skills including retelling stories, telling personal stories, and answering questions about stories (Bilyk, Kajain, Petersen, & Spencer, 2013). As a language teacher, I often teach the language through the use of story telling, and we focus on these same narrative skills in my classroom. This particular study looked at the effect of individually delivered language intervention on the narrative skills of pre-schoolers who had developmental disabilities as many of my own students do. The study used Story Champs, which is an intervention curriculum that can be used to help children develop narrative skills. In this study daily intervention was delivered using pictures and icons to assist students in the retelling of a story. Through the use of Story Champs the students that participated in the study were able to go home to their parents and use the pictures to retell a story (Bilyk et al., 2013). In reading this particular study I have been thinking back to the maker movement, repurposing technologies and resources that already exist, and how I can apply them to my own practices. In my classroom we have a lot of open discussion and tell a lot of stories using our target language. The students who “get it” thrive, but the students who struggle with narrative skills continue struggling. The simple answer in the study above was to slow it down with those students and use a variety of visual aids to help facilitate the narration of a story or a situation. The next article that I found was called “Professional Development and Teacher Efficacy”. This study looked at the struggles that teachers have in providing students the type of learning activities that best help them to learn in classrooms that are full of students who learn through various styles and have differing needs. This is a topic that I can relate to all too well. The idea that students learn differently from one another is not a new concept; yet, often times when we teach we take a “one size fits all” approach within our classrooms (Dixon, Yssel, McConnell & Hardin, 2014). This is not effective, and continues to be a huge problem in our education system. Students that work within a classroom where teaching methods are differentiated are often more successful, however many teachers struggle to do this. Teachers who struggle with differentiating instruction often do not feel confident in their own abilities to teach. This particular study looks at teacher efficacy in relation to providing differentiated instruction. A teacher who identifies varying needs within their classroom and may understand the strategies introduced to them on differentiation in professional development, they may not translate these skills into their classroom. The reason that this happens is that teachers may not be comfortable in their own knowledge of their content area, and as such do not feel that they can be flexible enough to adapt their lessons to the varying needs of students (Dixon et al., 2014). In reading this I reflect back to an earlier point in my own career, and think that this reasoning is probably accurate. Now I am very comfortable in my content area, but still uncomfortable adapting my own lessons. I went through an alternate route to education, and as such did not have the same types of methods courses that many of my colleagues had. As I continue to grow and learn and take classes through this MAET program, I am becoming more and more comfortable in adapting my lessons to fit the various needs of my own students. While I have always been rated an effective teacher in my evaluations, I know that I still have room to grow. In the past I have taught higher levels of Spanish and as such, did not really have a need to differentiate my lessons. I was teaching to students who for the most part did not have any learning disabilities, but also were passionate about the subject. They had an intrinsic motivation to want to learn a language. This year, in teaching Spanish 2 as opposed to Spanish 3, 4, Advanced Placement, or even IB Spanish I have a different type of student. As such I need to be looking at different ways to maximize their achievements, and look forward to my continued growth and improvement as an educator. This research fits into the Maker Movement as a whole because studies have proven that students learn more effectively through individualized learning. Giving students the opportunity to learn, explore, create, and share their findings with others is far more effective than traditional boring lectures, or finding ways to use technology to “spice up” our traditional lectures without really changing them. When I initially began studying the Maker Movement I approached it with a but skepticism as I thought that there was no way that these principles could be applied across all subjects and curriculums, but the more that I learn the more that I understand that the Maker Movement can be applied across various contexts. The particular research that I have referenced above applies as we can individualize learning in any classroom in order to help students gain a deeper understanding of the curriculum. This can be done using various visual aids in any subject. If a student is able to narrate events that happened in English class, or summarize and explain mathematical properties or scientific theories and laws, they will gain a deeper understanding of those topics. For my CEP 811 class this week we were challenged to repurpose things that we found in a thrift store, or had lying around the house into something that we could use in our class using our “Maker Kits”. For my Maker Kit this semester I have decided to use MaKey MaKey. MaKey MaKey retails for $50 and can be ordered directly from their website. Back to MaKey MaKey. MaKey MaKey allows you to repurpose objects to be interactive with your computer through the completion of a simple circuit. When I first got my MaKey MaKey I was excited to unwrap it and have the chance to play with it. I had heard of them before, but never thought that I would have the chance to use one. Much to my disappointment, my MaKey MaKey was defective. The people at Joy Labz were very helpful. They spent about a week troubleshooting with me by going back and forth over email. Upon determining that I had a faulty board they sent me a new one free of charge. I only had to pay the $5 shipping cost. Excellent customer service! You could turn fruits and vegetables into a keyboard, draw an interactive keypad with a pencil, use PlayDough, along with pretty much any other objects that are slightly conductive. In thinking about using this tool, I began thinking about how I might incorporate its use into a World Language Classroom. The way that I want to use it as vocabulary reinforcement. 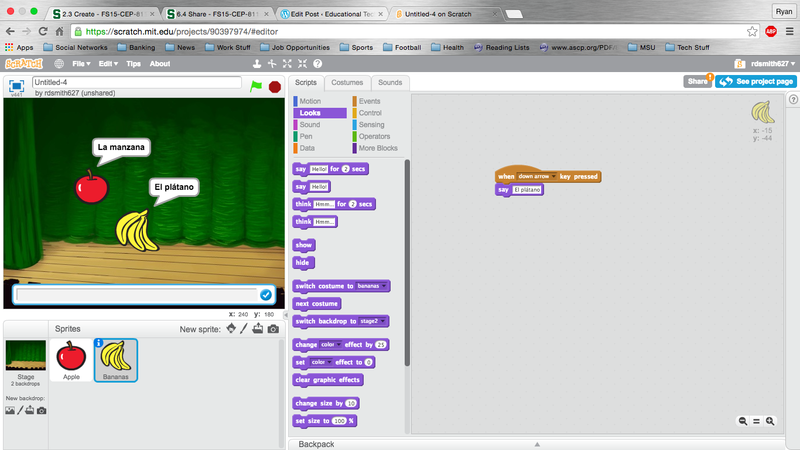 I would like to have my students make games using a MaKey MaKey and a program called Scratch. Ultimately, the game will have them identifying vocabulary words (think foods, body parts, classroom objects, etc.) By having them touch the vocabulary object that is connected to the circuit as can be seen in the video below. For this prototype I have chosen to use two different foods that I had around my house: an apple and a banana. In my first endeavor with Scratch I had to create two different sprites to represent my apple and banana, and program them with what I want them to say when their corresponding fruit which is hooked up to the MaKey MaKey is touched. For the apple, when touched it will say “La manzana” and the banana will say “El plátano”. Connect a lead to earth. This needs to be touching you for the MaKey MaKey to work. Connect one lead to your apple, and the other end to your MaKey MaKey. Connect it to the part of the keyboard that you wanted it to represent. I chose the up arrow. Connect your banana to the MaKey MaKey. For the banana I connected it to the down arrow. Setting a backdrop: Click on new backdrop in the bottom left corner in order to set whatever background you want. Delete the original sprite by clicking on it and pressing backspace/delete. To create a new sprite click on new sprite and select the icon that you desire, in this case an apple. Repeat this process to create your banana sprite. To make it “speak” when clicked go into the events tab under scripts and drag the “when _____ key is pressed” bubble to the right. Go into the looks menu and drag the “say ______” bubble to the right and attach it to the “when ______ key is pressed” bubble. Repeat this process for your banana. Enjoy! I am really excited by this and what I will be able to have my students do using a MaKey MaKey and scratch. Check back for a future post on my Maker Lesson Plan. Note: The photo and my video add meaning to my post by showing the MaKey MaKey working in conjunction with the fruits and Scratch when they are touched. The photo was added because after several video attempts things just weren’t as clear or as visual as I wanted them to be.